環境展 N-EXPO2014 ご来場のお礼: リサイクルエナジーブログ　RECYCLE ENERGY CO.,LTD. 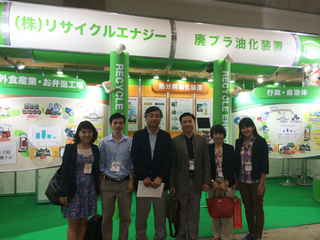 From 27th to 30th May we held an exhibit at the 2014 New Environmental Exhibition, held at Tokyo Big Sight. We had many people come to our booth and we thank them all very much. Interest was higher than the average year and we handed out one and a half as many pamphlets as we did last year. We’ve been working hard on our research since last time, so we were able to present a lot more details to our visitors. Many people came from overseas to visit the exhibition, and we were very pleased to answer some very enthusiastic questions from a customer from Vietnam. We were very happy to receive a box of wonderful coffee as a souvenir. we found a lovely coffee leaf inside. We consider the Environment Exhibition a very important part of our yearly schedule because it allows us to connect many people from all over the world. We want to continue doing this and look forward to having it again. Lastly, we’d like to thank all of our visitors and customers again. This exhibition would not have been such a success without them and we greatly pleased by the reactions we received at the exhibition. We will continue working hard on our business and our research from now on. If you should have any questions in regards to our products, please do not hesitate to contact us through this inquiry form.